Vista Kicks showed a lot of drive when they took the stage at The Cowan in Nashville, Tennessee on March 10, 2018. 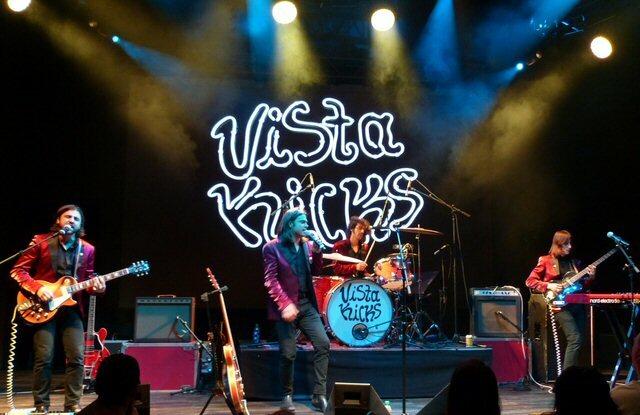 Vista Kicks is a group of twenty-something-year-old-retro-rockers. Their contemporary sound echoes of classic rock ranging from British Invasion, glam, pop and boot stomping bar rock. Despite their age the quartet reports that they have already put in 10,000 hours which enabled them to play an A game on Saturday in Music City. Vista Kicks booty shaking tour rolled through Tennessee in March 2018. A few years ago, life-long friends Derek Thomas (vocals, guitar, keys), Sam Plecker (guitar/vocals), Trevor Sutton (bass), and Nolan Le Vine (drums) made a collective decision to move to Los Angeles to pursue their musical dreams. Within a year, Vista Kicks' independent 2016 Chasing Waves EP along with additional singles generated over 5 million cumulative Spotify streams and 3.2 million YouTube views. In September 2017, the band released their debut fifteen track record aptly entitled Booty Shakers Ball. The self-produced album has been described "as a smoked-out collaboration between James Brown and Jimmy Page, it bridges eras." "We're old soul millennials," exclaims Trevor. "We're young and wound up like everybody else our age, but our roots go deeper. We've found an audience that's just like us. It's rock music that you can shake your booty to and party." Reminiscent of the early Beatles and Motown the lads were attired in matching outfits. Derek greeted the crowd before they opened with the good grooves of "Gimme Love" and a giddy "Giuliana". Since they are touring in support of Booty Shakers Ball much of their set featured songs from that platter. Although they mentioned that a new one was in the works so they played some new tunes which were just as danceable as the material from Booty. Vista Kicks: Our view? We saw drive, determination, talent and charisma. To the tops! "Please Don't Make It Harder" blended a number of styles from to soul to an almost spacey psychedelic sound. Next, was the title track for the next album. "Twenty-something Nightmare" started off pensive but as the angst increased so did the pace. "Gotta Get Away" was a catchy, relatable number about a bad relationship. "Fight The War" could be a modern day anthem to pursue one's dreams punctuated by bold guitars and brash vocals. For the group "it was about our struggles in the business," sighs Sam. "A couple of years ago, we were doing a lot of songwriting sessions. We'd go into these sessions, and we'd be told these songs aren't good enough. We had fans saying just the opposite. We didn't have respect from the industry; however, the people did respect us. We sided with our fans." "Monkey Business" concluded the concert on a primal note but the boys quickly returned for an engaging encore. 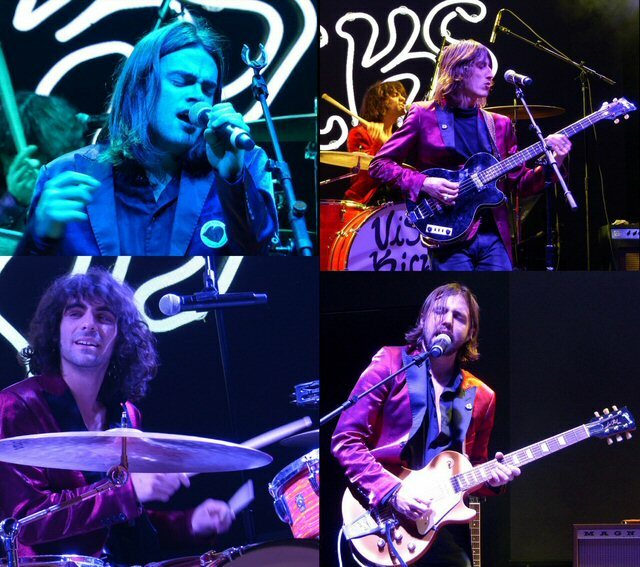 With a driving force Vista Kicks presented a fine set of their feel good rock & roll at The Cowan. Their show was a dance party with plenty of respectful nods to the past. Although the Booty Shakers Ball tour is coming to a close it's likely Vista Kicks will be back on the road soon with their energy, charisma, originality and strong stage presence in tow. They've already made it to Topgolf - the next stop might be the top. The Cowan is the two-story, 600-person live music and private events venue adjacent to Topgolf Nashville located at 500 Cowan Street. With an open floor plan along with a private VIP area, The Cowan features established touring acts such as Vista Kicks, as well as up-and-coming Nashville artists. "We want to reinforce our commitment to Nashville's local culture and music scene," said Topgolf Entertainment Group Executive Chairman Erik Anderson. "The Cowan is a space for Nashville to gather with friends and enjoy incredible live musical acts featuring state-of-the-art sound quality" and if those fans like golf - all the better. "Ever been bowling? Well, at the recently opened Topgolf Nashville, you play in a "bay" rather than a lane and from that bay, you hit micro-chipped golf balls into giant targets in our outfield to score points. This state of the art facility has three levels of outdoor but covered bays along with bar and sitting areas. Topgolf also has an extensive drink and food menu. Since we were at the facility for the concert we did not play on Saturday night but the place was buzzing and it looked like folks were having a bucketful of fun. So please check out both Vista Kicks and Topgolf soon. Thing were really rockin' and rollin' on a Saturday night at Topgolf.